A twisted magnetic field structure, previously never seen before at Saturn, has now been detected for the first time, using instrumentation built at UCL and Imperial College. When the Sun’s magnetic field interacts with the Earth’s magnetic field (the magnetosphere), a complex process occurs called magnetic reconnection which can twist the field into a helical shape. 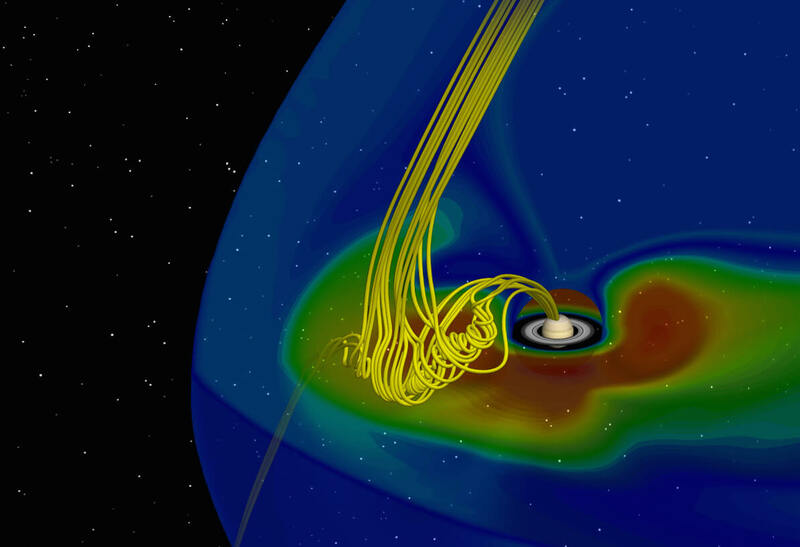 These twisted helically structured magnetic fields are called flux ropes or “flux transfer events” (FTEs) and are observed at Earth and even more commonly at Mercury. The conditions that allow FTEs to be generated at a planet worsen with distance from the Sun, however they have been observed at all the planets out to Jupiter. The observation of this phenomenon at Saturn has been elusive. Searches have been undertaken to find an FTE with NASA’s Cassini spacecraft, with reports published of none being found. Up until now…. The Cassini spacecraft has been in orbit around Saturn since 2004, and after many years analyzing the data collected, Cassini has observed the first FTE at Saturn. The observed magnetic signature was successfully compared to that of a model to show that Cassini indeed observed a flux rope at this giant magnetosphere, and that the spacecraft passed close to the structure’s center. It is also estimated that the flux rope could be up to 8300 kilometers wide. "Contrary to previous ideas about Saturn's magnetosphere being unlike its terrestrial counterpart, these findings reveal that Saturn at times behaves and interacts with the Sun in much the same way as Earth." Jamie Jasinski, UCL Space and Climate Physics PhD graduate now based at the University of Michigan, and lead author of the new paper published in Geophysical Research Letters. This not only shows that magnetic reconnection occurs at Saturn but also that Saturn’s magnetic field can at times interact with the Sun in much the same way as at Earth. The analysis was completed using a particle spectrometer built at UCL and a magnetometer built at Imperial College, both of which are onboard NASA’s Cassini spacecraft. The Cassini mission will end in November 2017, when the spacecraft will be steered into the planet to study it, before disintegrating in Saturn’s thick atmosphere.